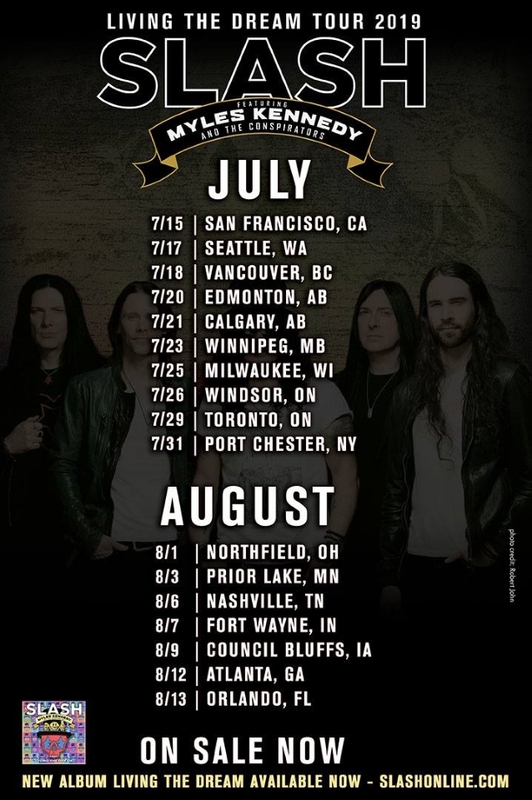 SLASH FEATURING MYLES KENNEDY AND THE CONSPIRATORS Summer 2019 North American Tour! Slash Featuring Myles Kennedy and the Conspirators are touring North America this summer (supporting their latest album “Living The Dream”) and there’s a Vancouver date! Fan-club pre-sale is ON NOW! Use the password “SLASH19” to purchase tickets. The band released “Living The Dream” in September 2018 and is Slash’s fourth solo album and third with Slash w/ Myles Kennedy (vocals), Brent Fitz (drums), Todd Kerns (bass and vocals) and Frank Sidoris (guitar and vocals). Are you going to the July 18th show? Will you go to more than one show on the tour?